Carte de l'Empire Francais 1812. This is a scarce and beautiful 1860 elephant folio map of the Europe depicting the French Empire, issued by A. H. Dufour. The map covers the entire European continent from Ireland and southern Scandinavia south the Mediterranean Sea and east as far as the Black Sea. It depicts the extent of the First French Empire or the Napoleonic Empire at its height in 1812. The Empire included the modern day countries of France, Switzerland, Slovenia, Croatia, Belgium, Netherlands, Germany, Poland, Lithuania, parts of Italy and Austria. In 1799, following the French Revolution, Napoleon Bonaparte staged a coup which led to Bonaparte's dictatorship and eventually (in 1804) his proclamation as Emperor, which marked the end of the republican phase of the French Revolution. The 1812 French invasion of Russia marked a turning point in Napoleon's fortunes and led to the defeat of his forces at the 'Battle of the Nations' in 1813. In 1814, a coalition of European powers defeated France and forced Napoleon into exile on the island of Elba. Napoleon's escape and final defeat at Waterloo would end 22 years of almost continuous warfare (the French Revolutionary Wars from 1792-1802, and the Napoleonic Wars, 1804-1814). This map was prepared by Auguste-Henri Dufour and engraved by Charles Dyonette for publication plate no. 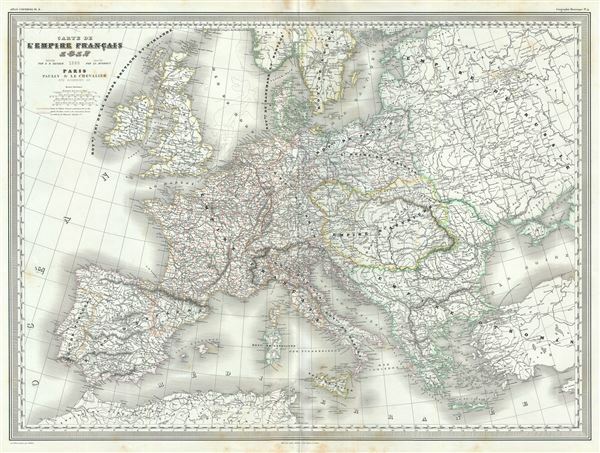 9 in Armand Le Chevalier's 1860 edition of Atlas Universel, Physique, Historique et Politique de Geographie Ancienne et Moderne.